Life is a journey is an oft repeated cliché. There is truth in it. What better way to describe the path we each travel from birth to death. My Bert and I recently celebrated our 50th wedding anniversary. I have been pondering our journey together. There have been many journeys within the journey. All began as unknown territory. Journeys begin with hello. They end with goodbye. Some flash by like comets others are slow perambulations. Some are sunlight, some are dark night; some give you strength, some make you weak. Some you want to hold forever; some you can’t wait to let go. Some make you laugh until you cry some only make you cry. There are journeys that you seek and journeys that are thrust upon you. Some journeys lead you to people who become Lifeliners, friends forever. Some lead to people who are fleetingly important for just a moment in time. Journeys are moments, no matter the duration. Some are landmarks of your life that help you find your soul, your strength, your spirit. Journeys are multifaceted. You juggle the segments, living them concurrently. Journeys teach you to multitask. Journeys are never straight, direct or easy. Yet once you begin you must continue. Some journeys seem never ending. You stumble, ineffectual, distraught, full of fear, numb with disappointment. You see chasms and dangerous cliffs, mountains that seem too high to scale. There are twists and turns and unexpected obstacles. These are the fragments that seem to be put in your path to frustrate you, only you. Now comes the realization that this is really your journey, only you can walk this particular road, only you can make the decision which path to take. It is wonderful when you can take control of the journey. You have solutions to problems, answers to questions; you dream the impossible and see it become possible. You start out in uncharted waters diving into unknown territory and surprisingly make a safe, happy landing. Yes, some journeys are wonderful, delightful and satisfying. Each one has a life journey. How you travel it is up to you. You can accept the help of friends and family with grace. You may show gratitude for the kindness of strangers. You may be lucky to give love and have it returned twofold. In the end your journey will be a reflection of your truth, of you. More than 50 years ago My Bert and I like so many others have over the years, made a decision to walk our journeys together. What a journey it has been and continues to be. On this challenging leg the decision on how the journey unfolds is mine to make for both of us. 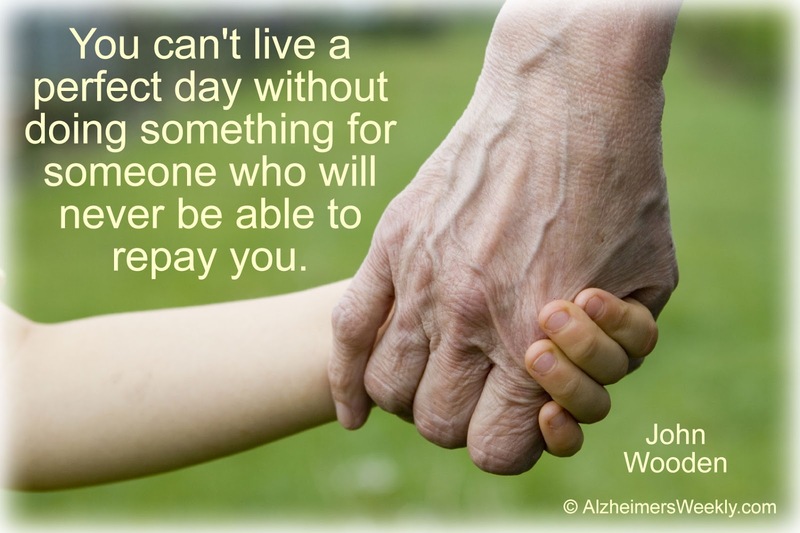 I can make us both miserable; bemoan the unfairness of it all or I can embrace the privilege that it is to be a caregiver to the one you love and to whom you are the world. My Bert and I are still saying hello to love, to life, to joy. We embrace the moments and while they are fleeting for him and lasting for me they are our moments. His journey and mine will commingle as they have for more than 50 years. We will continue to walk in tandem and greet each day with hope that it will be a good day. The Meander: The day you are born is the day you begin to die. That is inevitable, inescapable and undeniable. As my Bert and I continue to say hello at the dawn of each new day I hope we will both be able to rise to the occasion and be ready to say goodbye at journey’s end. In the meantime we will keep on with the journey. We will live the moments and not look around the bend. Why bother? What is there will come without fail. Friday January 11, 2019 I woke up very early. The weather report said it was -12 Celsius with a wind chill of -20! Brrrrrrr. But this is Canada in winter. January 11, 1969 was on a Saturday. When I awoke then it was already 28 Celsius with a projected high of 30! But this is Jamaica in winter. The coincidence did not escape me. Fifty years married and a 50 degree difference in temperature. On Friday, January 11, 2019 my Bert and I celebrated our 50th wedding anniversary with 50 close friends. It was a Golden night, a night filled with love and Light. The setting was special, decorated in gold and white. The dinner was marvellous. The toasts were heartfelt and warm and so eloquently delivered. Best of all was the love that seemed to permeate every corner of the room. I saw friends making friends. I saw smiles, heard joyous laughter, saw caring glances and chuckled at the comments made at our ‘before’ and ‘after’ photographs. It was a night to reminisce. Fifty years is a long time together for any couple. During that time we loved, we argued, we worked, we had successes, we had failures, we gave, we received, and we brought two wonderful children into the world. We mourned, we hoped, we laughed, we always laughed. We travelled the world, we helped, we got help, and we supported and received support. It was a celebration of friendship. Throughout our lives my Bert and I have been blessed with the most wonderful friends. We are so grateful for that so decided we would do our best to have some of them share in our joy and to let them know how much they mean to us. They were representative of so many more whose influence and guidance and love have helped to make us who we are. It was a night of family and friends who are family in every sense of the word. There were some we missed, but who were with us in spirit. Our best man at our wedding could not be with us in person but he was with us in song as his recording of The Prayer was played. At our age some who wanted to be with us could not for a variety of reasons but we still felt their love. The highlights are many. The wonderful paean from our dear friend; the tribute from our beloved son; the reading of Sonnet 44 Elizabeth Barrett Browning ‘s How Do I Love Thee. However, the greatest moment of sheer immediate and spontaneous laughter happened when we attempted to renew our vows. Our family friend and Minister had in perspicacity and necessity reduced the vows to a simple: “…Bert I ask you, do you still want to be married to your wife Paula?” Bert looked at him and said: “Let me think about that.” The laughter filled the room. I was in stitches as I thought: “That’s my Bert.” As usual, my Bert set the mood for the rest of the night. It was laughter, joy, Love and Light in the company of family and friends. The Meander: My Bert and I opened the dancing with ‘our song’ Unchained Melody. As we danced, my Bert held me close and sang the words throughout to me. In our eyes was only love. Love endures.